Service dog training schools train and place assistance dogs. Federal law doesn’t require service dogs to undergo formal training, but training schools are a huge help to people with disabilities who aren't experienced or comfortable with the idea of training their own service dogs. There are several different types of training schools. Some are structured to teach people with disabilities how to train their existing pets to become service dogs. Other types of aide dog training schools breed their own puppies, raise them, train them, and match them with their future handlers when the training process is nearly complete. Puppies in service dog schools typically start off their training by learning house manners, crate training, and basic obedience commands, such as sit, down, wait, and come. Potential service dogs also acquire proper social behavior skills, learn to perform tasks for the benefit of their human partners, and undergo public access training. The length of service dog training programs varies depending on the school. Most programs last 4 to 12 months. It is ideal for service dogs to complete follow-up training sessions throughout their lifetime. It is the owner’s responsibility to ensure that the training is reinforced. There are numerous service dog training schools located throughout the United States and beyond. Every dog training program is unique, so it's important to research your options thoroughly until you find a school that fits your specific needs. Not only do you have to consider which tasks you need your service dog to perform, you also need to determine what lengths you’re willing to go to get a service dog. For example, you may have to travel across the country to pick up your service dog. If you do travel far, you will have limited follow-up support from the program once you return home. Another important factor to consider is the cost of acquiring a service dog. Some service dog training programs charge steep fees. Others provide service dogs at no charge, but put you on a waiting list. Furthermore, many training schools require you to attend a training camp with your dog, which can take two to three weeks. You will find directories of service dog schools on the Internet. Yet, be aware that not all schools provide the same caliber training even though they may appear in an online list. Instead, use the following resources for finding quality service dog training schools. It's up to you to do your research and ensure that a training school satisfies your needs. Check the status of the training programs you're considering with the Better Business Bureau to verify whether any complaints have been filed. You can also find local service dog trainers that don’t advertise by visiting humane societies, breed clubs, pet supply stores, and other similar organizations in your area. 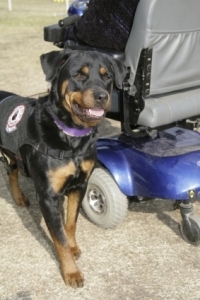 For information about different roles service dogs play, please click here: Service Dogs.